This intriguing, spell-binding read from award-winning author Brian Falkner touches on themes of survival, personal responsibility and domestic violence, all couched in a unique and gripping adventure story. Brought up in the bush, hiding from a violent father, Egan must venture out after his mother fails to return home one night. He finds surviving on the streets of Auckland much harder than in the wild. Riveting. “You who are on the road must have a code that you can live by” these lyrics from a 1970 Crosby Stills and Nash song ran through my mind as I was reading this superb novel. Egan and his Moma have lived in the remote forests and bush of the Coromandal Peninsula for 15 years since Moma fled from an abusive husband with Egan as a baby. She taught him well, bringing him up on a code that is not unique- based on the Golden Rule, and written by every philosopher from Socrates to Fred Dagg. Egan is well read and wants to be a writer, Hemmingway and Steinbeck are favourites. Some of his stories are spread throughout the novel. The Code works well in the bush where there are no other humans, until Egan meets D.O.C. deer culler J.T. Hunter. Egan and his dog Jack like J.T. and they learn much from each other, then Moma goes missing. Egan looks for clues in his mother’s papers and this takes him to Auckland. This is part 2 of the novel with Egan describing Auckland as a bonfire that needs constant feeding. He learns to live with the street kids and finds violence and love. He could survive anything but The Code by which he has lived is sorely tested. Part 3 tells the father’s story and Egan learns what celebrity status means. The Code is further tested and broken. I would ruin it for you if I told you anything else. Falkner narrates the story in diary form through Egan from December to March and it is totally compelling. The wit, the humour, the characterisation and the flow of the novel are strong traits of all Falkner’s novels, this is no exception. I was mesmerised from start to finish and you will be too. It is a triumph for motherhood. Mention must be made of the cover, it is outstanding, any reader can see what the novel is going to do from the cover. The best I have seen for a long time. Would be a great text for students from year 9 – 11 and great reading for everyone else. My book of the year so far. If a reviewer can have their best book of the year, this is mine. 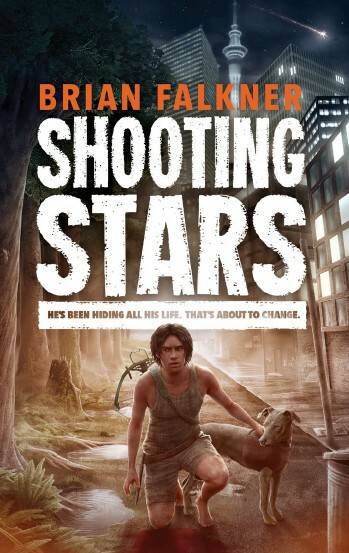 Shooting Stars is written largely in diary form over a four-month period by Egan, a teenager who has lived an isolated life in the Coromandel forest with only his mother and his dog for company. One day he meets a deer culler, JT, and they become good friends. When Egan’s mother does not return from a trip to replenish supplies, JT is no longer there to help. With only a limited knowledge of the outside world, but with Moma’s Code of Honour to live by, Egan heads to Auckland to search for her and JT. He sleeps rough, becomes involved in fights with streetkids, befriends one group, eventually is found, and goes to live with his father. His story becomes a news sensation. Where relevant, each diary entry ends with an explanation of one of his mother’s Codes: a Thought for the Day, A Word of the Day, Book I am Reading, Things I am Afraid Of (or No Longer Afraid Of). Through these the reader learns more of Egan’s character. Only 15, he is a thoughtful and resourceful boy whose love for, and belief in, his mother is challenged. His other great loves – the bush and books – sustain him, as does his growing awareness of the impact his mother’s Code is having on most of the people he meets. While Egan appears naïve to some, his steadfastness in the face of adversity wins over all but the most cynical and hardhearted. For readers who have not discovered Brian Falkner before, this book is an excellent introduction. He has upended the adage that stories with a moral should not spell these out for the reader. Instead, the 30 Points of Moma’s Code of Honour are central. This is a teenage story that could well become a classic, a personal and classroom favourite. A tragic ending can be turned into something uplifting, leaving the reader with plenty to ponder, plenty to discuss. A fascinating and highly original novel about a boy raised in the bush on the Coromandel, who is thrust into the world after his mother goes missing. So many different elements come together: strong, evocative writing, authentic dialogue, complex characters, a page-turning plot, the 'code' Egan lives by, and challenging themes of domestic violence, systemic injustice and living ethically and authentically. One of the BEST reads of 2016! I devoured this in two days (and it would have been one if I hadn't had the whanau visiting most of yesterday). It will not be enough for me to read this book - it is something I need to own. Quintessentially Kiwi but with a universal message. Written in an eclectic style with a mix of diary, short story, poetry and transcripts it vividly created a host of different environments and posed moral dilemmas that kept me thinking and turning the page. The action was not forgotten either as the pace was maintained throughout. Hats off Mr Falkner. I wasn’t sure how I was going to feel about this book, but I actually loved it. I wasn’t sure if I would be able to connect with Egan, especially after the last book I read taking place in modern day Auckland with a male lead was Into the River. But Egan was very likeable, the prime example of innocence and wonder, something with is usually reserved only for young kids, not older teenagers. It was refreshing to see my city from the eyes of someone new to it, and someone who really doesn’t understand it. Some background, Egan has grown up in hiding in the bush with only his mother for company. His story is about his journey to find his mother who has suddenly disappeared, while trying to avoid his famous father who was very abusive. He travels to Auckland in search of her and experiences a first love among many firsts. The way cursing is approached in this book was adorable, as it’s quite clear Egan doesn’t actually know any, and his interpretations are great. I would recommend this book, it is an excellent story told in journal entries which makes it an easy book to read little and often. Egan has lived his whole life hidden from the world, protected by his mother who snatched him away when she ran from an abusive husband. For fifteen years they have lived in the forest, surviving on the wilds of nature. He knows the bush and forests of the Coromandel Peninsula so well. It provides all their needs. He spends much of his time scouting the bush, hunting pigs with CrackerJack, his faithful dog. On one of these hunts he meets DOC deer culler J. T. Hunter and this encounter changes everything for Egan. They become friends and for Egan who has known no-one else except his mother, this relationship becomes an important aspect of the novel. Then Egan’s mother goes missing and he finds himself in Auckland searching for his moma. Auckland is a world of noise and people, cars and technology. It is a world he has only read about and his adjustment is both difficult and intriguing. The language of the street kids he encounters is foreign to him but he is determined. He may be well-educated from the books he has read, mostly from second-hand classics his mother has bought him over the years but he is also very naive. These books are the reasons he wants to be a writer and the reason he writes his diary. I love how Egan is both gullible and strong which comes through perfectly in his diaryand his relationships with the street kids he meets. His mother has taught him a set of codes to live by and these codes guide him whenever he faces different or difficult situations. I was totally swept away with Egan and his life. Falkner’s quality writing made these people very real. This is certainly a story with a difference and one that will be enjoyed by many teen readers for its action and great characters. After reading this book, the thought occurred to me that this would make a good movie. Falkner has written a truly gripping story that is essential reading. It contains pathos, joy, hope and despair, leading us on a rollercoaster of emotion which we only survive by hanging on to 'the rules' for dear life. One of the best YA books I've read in a long time, and set to be my Book of the Year, I suspect. Egan will stay with me for a long time. He lived #2, and taught us #10.